The squirrel revolution has begun! After years of oppression and acorn hording, the commoners have revolted. Pick up your weapon and fight for the oppressed, or fight to keep your stockpiles of nuts to yourself. Acorn assault is a turn-based match-three strategy game where you can fight against the computer or a friend in local or online battles. 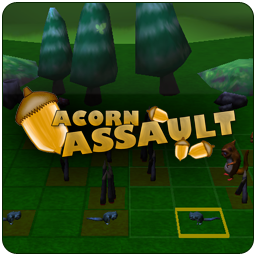 Since the launch of our first game, ZomNomNom, we have been planning and working on Acorn Assault. For those that have followed us, you will remember our entry in the Ouya Create Game Jam by the same name. Since the game jam, we have been working on building our own world of characters and improving the game based on the feedback we got from the community. The game will be releasing this summer on the Ouya game console along with PC, Mac and linux! We will have more to announce about this game soon, so follow us on Twitter and Facebook for the latest news! We Made a Game About Battling Squirrels for our First Game Jam! Play It!